Spring is here and I finally got some spring cleaning done around my house. Ok, I cheated and had some cleaners come in, but I did manage to purge some extra clothes and polishes that were lying around. It feels wonderful to let go of excess! Have you done any purging or cleaning lately? 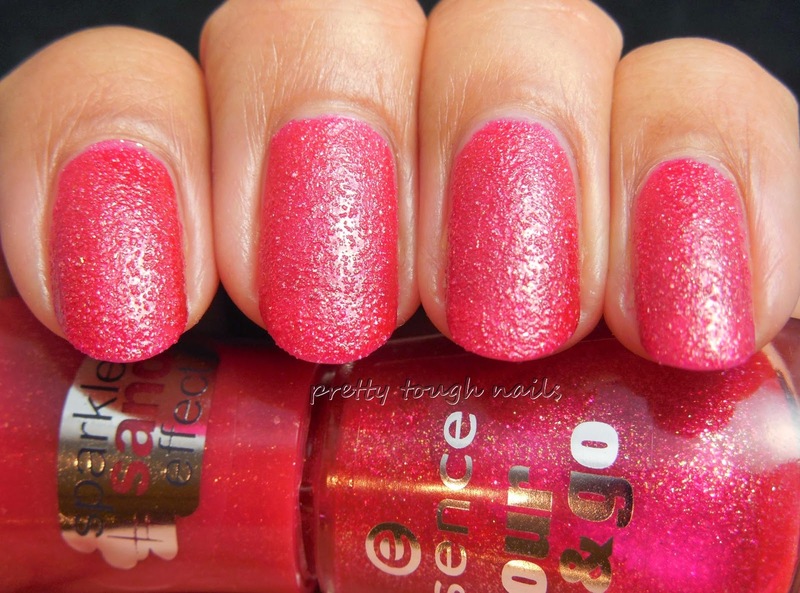 I've been craving a good texture polish and when I found an Essence one at Ulta the other week, I squeed in joy. 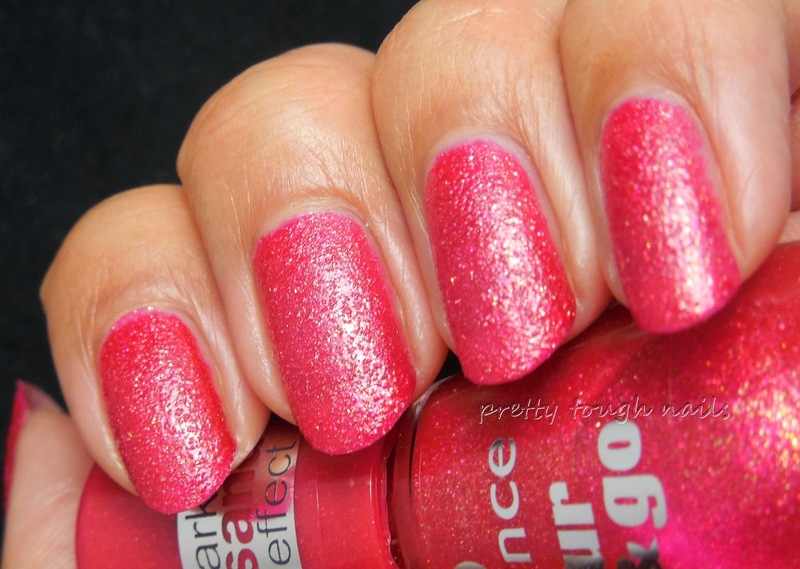 How can you beat a sparkly texture for $2? 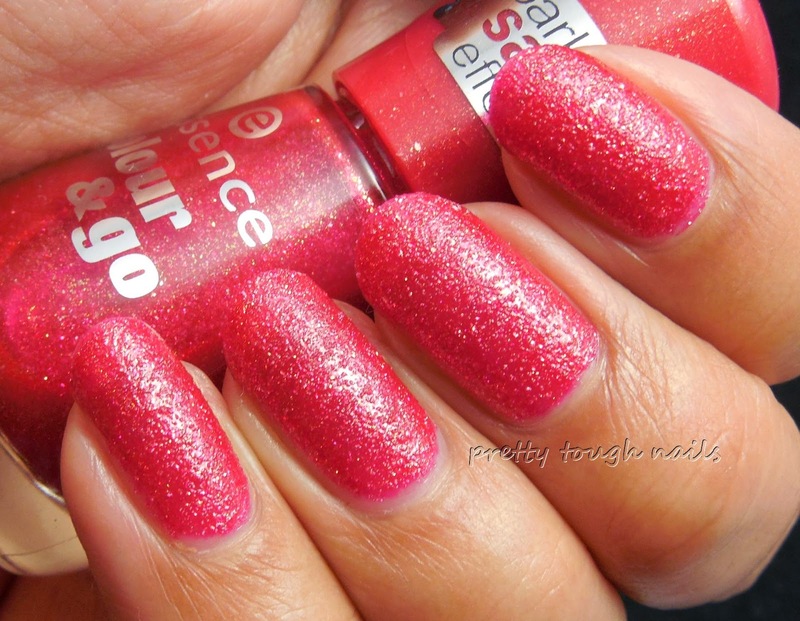 This is Me & My Lover, a pink leaning red with gold sparkles. With the multiple versions of OPI Jinx everywhere, I was intrigued by this color and hoped that it wasn't as orange as those. 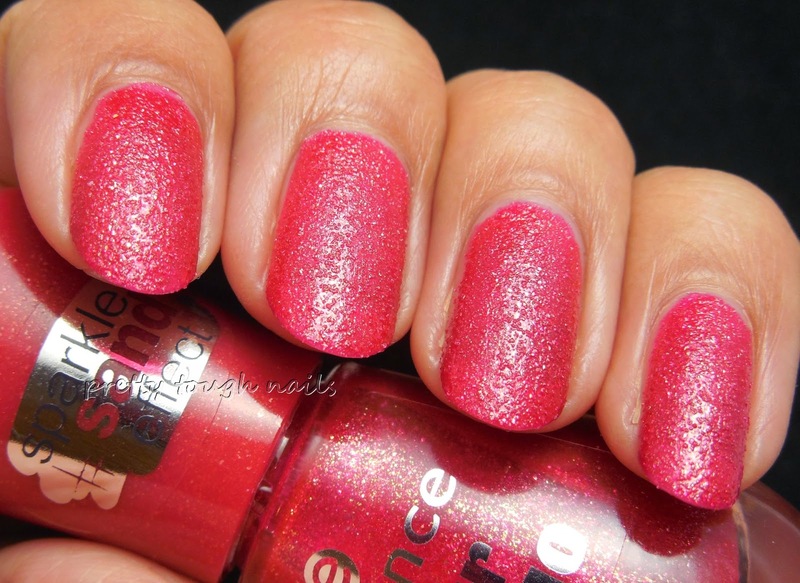 This aims to please and and succeeds as a nice red shade with no orange undertones, and lots of sparkling gold shimmer. I used two easy to apply coats and had no difficulty with application. This dried down quickly, and faster than other textures I've tried in the past. I wish the gold was more visible on camera, but trust me it's there. You won't be disappointed, especially at this price! This shade is part of the core line in the display, so if you're looking for it you won't have a hard time finding it. 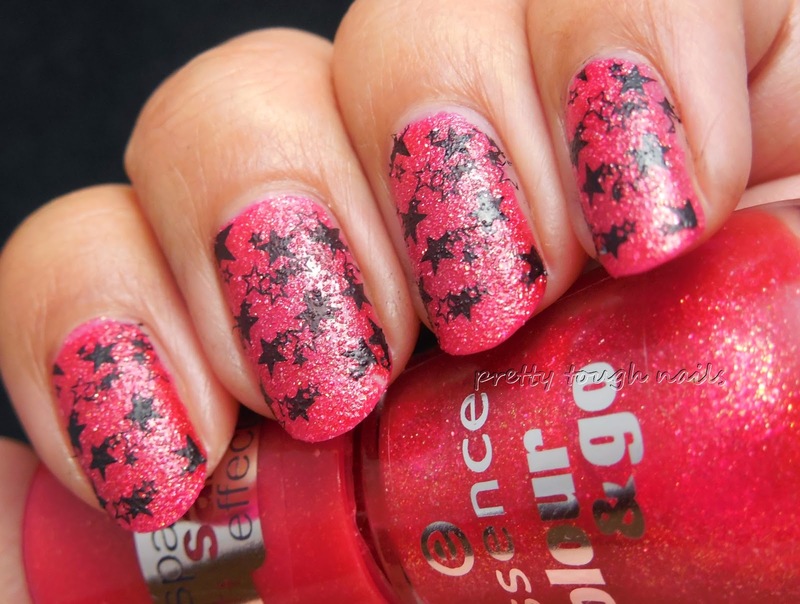 Next, to add some visual interest, I pulled out my Winstonia plates and did some stamping with WnW Black Creme. Stamping over textures isn't difficult as long as you let it dry down all the way, and press a bit harder than usual to ensure that the stamp sticks to the uneven surface. I pressed the extra fly away bits with my fingers to make sure they laid flat. Not so bad I suppose. I'm glad I didn't go with a denser plate design because I think it would have been difficult to get the stamp to adhere properly over the entire surface, especially when topcoat won't be used to seal it in. Plus, I get to enjoy all that sparkly goodness peeking through during the day! 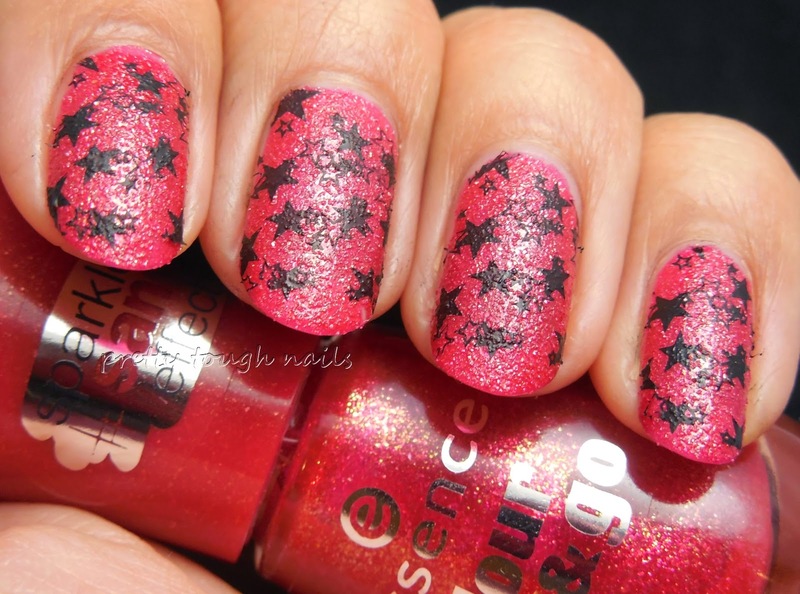 Have you found a good sparkly red texture yet? If you haven't, I definitely recommend picking this up when you're looking for a filler for your $3.50 coupon at Ulta! Such a pretty color on you, Thithi! 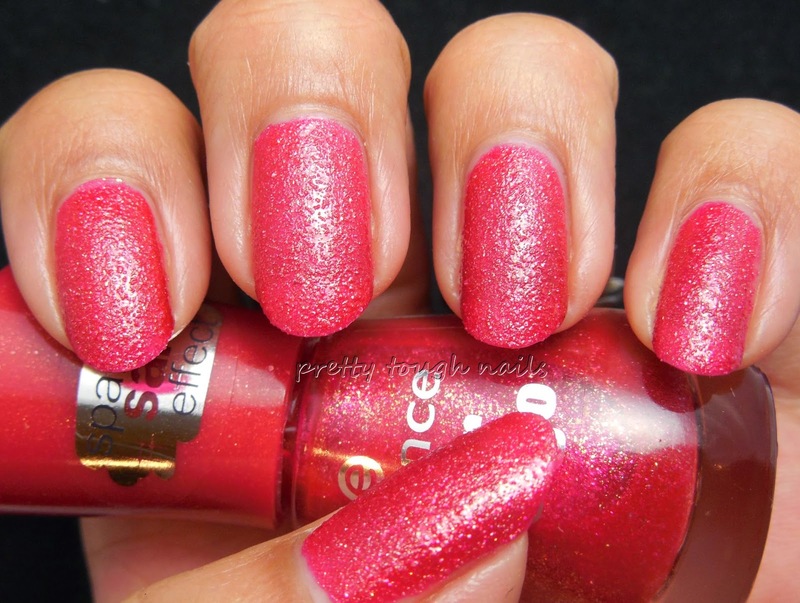 This reminds me so much of Strawberry Smoothies :) I love Essence, glad i can get it everywhere in germany, they have some great colors!